Through my work at Banting House National Historic Site of Canada, I’ve been able to do a bit of everything to keep the museum running, and that includes giving tours. Showing visitors around the house allows me to appreciate it even more. Last week, one woman commented on what a beautiful old building it is and was happy to see what nice condition it was in. She was surprised to learn that Frederick Banting only occupied three of the rooms while living here. When Banting moved into 442 Adelaide Street 1920, he had the intention of running private practice out of the house, hoping to gain patients in the developing city of London. The front room became his doctor’s office, and the small adjoining room was made to be an apothecary, making up two of the rooms he used during his time here. The front room is now set up to look how a doctor’s office would have appeared in the 1920s. On display is a bed for the patients, a desk, cabinet, book case and other furniture, and various types of medical supplies. It is important to show how the room would have looked during Banting’s time here, as part of our Commemorative Integrity Statement. Essentially, this means that that reasons for Banting House’s designation as a heritage site are taken care of and are effectively communicated to the public. It also means that the heritage value of the site is always considered any time new decisions are made. 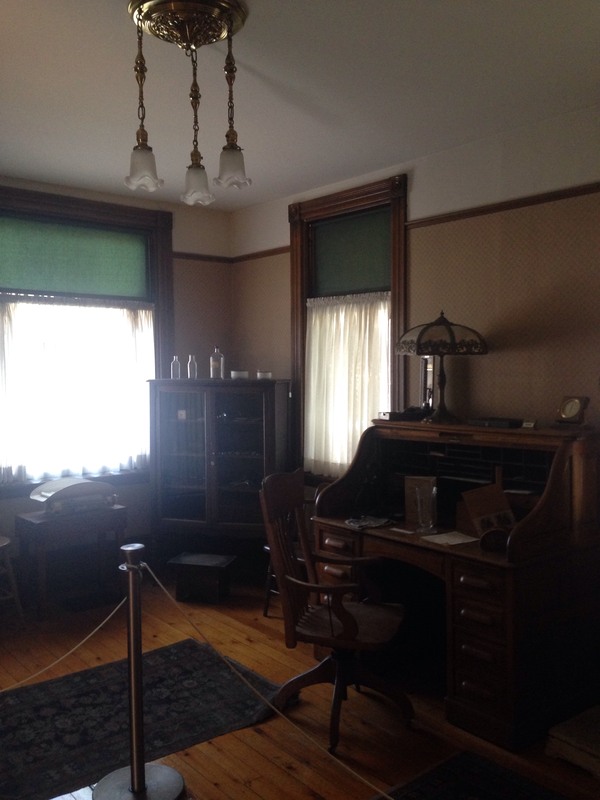 While not all of the items in the room were used by Banting, the doctor’s office is displayed to give visitors a sense of what the house would have looked like, and how his own office might have functioned. While Banting’s private practice unfortunately did not take off the way he had hoped, it set him on the path towards discovering insulin. It led him to take a job as a demonstrator in Surgery and Anatomy at the University of Western Ontario, which set him up with the information he needed to start thinking about diabetes research. The legacy of Banting’s work shows what an crucial moment his life in London was, however brief it might have been. We are very lucky to be able to show this part of his journey, and to highlight the importance of his time at 442 Adelaide Street.